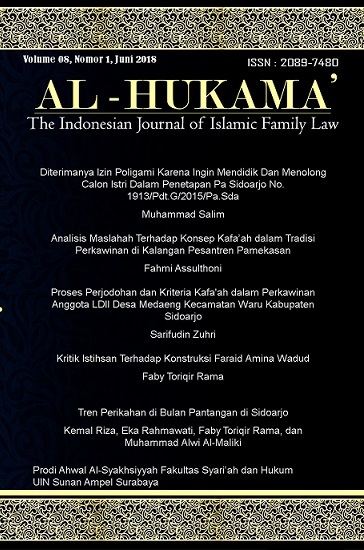 This paper is a bibliographical research on the process of marriage and kafa'ah criteria in LDII’s members in Medaeng, Waru, Sidoarjo under the perspective of Islamic law. This study aims to answer the questions of how the matchmaking process in the marriage system of LDII’s members in Medaeng, Waru, Sidoarjo and how the application of the concept of kafa'ah in LDII’s members in Medaeng, Waru, Sidoarjo and how the maslahah analysis of the process of matchmaking and the concept of kafa'ah in LDII’s members in Medaeng, Waru, Sidoarjo. This data of the research is obtained from the board of LDII of Medaeng, Waru, Sidoarjo which become the object of research. Technique of collecting data of this research are descriptive verikatif technique and deductive mindset. From the result of the research, it is concluded that kafa'ah match and criteria in LDII’s members are more inclined to fellow members or groups. According to Islamic law, it does’t matter to marry such a model as long as it aims to benefit and rejects the danger, because the main purpose of the Islamic law is promoting benefit for the people. In addition, during the process of matchmaking, it doesn’t against the syari’ah, then it can be done. Nevertheless, it is expected that LDII’s members in Medaeng, Waru, Sidoarjo are more open in understanding kafa'ah, because what is meant by kafa'ah in Islam is not limited to certain group of the people.